After the release of Apple iOS 6 beta at Apple's WWDC 2012 this month many iOS device users had switched their devices from old iOS firmware to the new iOS 6 beta firmware to check latest features and enhance performance which iOS 6 beta is offering to the users. The most advance operating system from Apple iOS 6 beta has also revealed the new features which is 3D Maps for iOS 6 which Apple has introduced on new iOS 6 Firmware version. So if you're running iOS 6 beta firmware on your device than you must be aware of Apple iOS 6 3D Maps feature its performance. Basically iOS 6 3D Maps are the new reinvigorated Maps app technology, which is no longer based on Google Maps data and the new iOS 3D Maps app also features turn-by-turn directions, and 3D capabilities. Now iOS 6 beta firmware device users can Install and Activate iOS 6 3D Maps on old iOS devices including Apple iPhone 4, iPhone 3GS and iPod 4G Touch which enable their maps to become and activate iOS 3D Maps features and functionality. For the installation and activation of iOS 6 3D Maps on your iDevice you must have latest iOS 6 beta firmware installed on your Apple iPhone 4, iPhone 3GS and iPod 4G Touch device. We will show you Step by Step Guidelines and Tutorial to Enable, Install and Activate iOS 6 3D Maps on Apple iPhone 4, iPhone 3GS and iPod 4G Touch. Your Apple iDevice must be a iOS 6 beta Jailbroken by using Redsn0w tool and having iOS 6 beta installed legally from Apple iOS Dev Center only. We cannot give guaranteed integration and activation of iOS 6 3D Maps on your device so you should proceed the guide at your own risk. Now let’s start the Tutorial and Guidelines to Enable, Install and Activate iOS 6 3D Maps on Apple iPhone 4, iPhone 3GS and iPod 4G Touch devices. 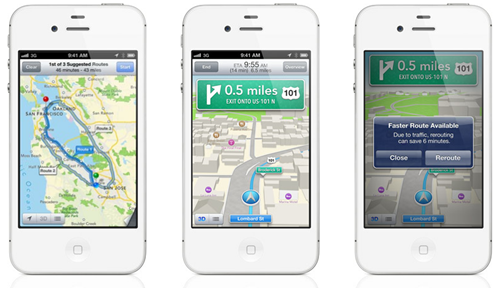 Just follow the following simple steps and guidelines to Install and Activate iOS 6 3D Maps on Apple iPhone, iPad and iPod. How to Install and Activate iOS 6 3D Maps on Apple iPhone 4, iPhone 3GS and iPod 4G Touch? If you have above mentioned requirements with your iDevice then follow the following simple steps and guideline to Enable, Install and Activate iOS 6 3D Maps on Apple iPhone 4, iPhone 3GS and iPod 4G Touch devices running old iOS firmware’s. Step 1: Open and Run your Jailbreak iDevice with Cydia. Step 2: Download and Install iFile from Cydia. Step 3: Download the .DEB file from here to install the 3D Enabler package. Step 4: Kill the pre-opened Maps App, and reopen it, and the 3D Maps icon should now be permanently visible. Congratulations!! You have successfully install and activate iOS 3D Maps in your idevice. If above mentioned method doesn't work with your Apple device, you can also follow the following method to install and activate iOS 3D Maps. Step 3: Download the .DEB file from here. Step 6: Ensure you respiring (or, to be safe, reboot) in order for the changes to take effect. Congratulations!! You have successfully install and activate iOS 3D Maps in your idevice.